Buying into the dream of owning a French property often means being seduced by the challenges of the inevitable “Renovation Project”. Overnight, it seems, hordes of Francophiles discover the joys and trials of re-pointing, dry lining and other assorted DIY jobs. Not only that but suddenly, we’re doing it all in French! For many of us, DIY used to mean a quick trip to B&Q or similar on a Sunday morning and an afternoon spent painting or tiling. Here in France, Sunday afternoons must be reserved for spending quiet time at home – not hammering nails into 2X4 or blasting the neighbours with the screaming of your new power saw. Worse still for the DIY fanatic, there are NO stores open on a Sunday! Not only that, but tools and equipment often seem to cost more in France. Help is at hand though. Last Friday night, we experienced for the first time a shopping frenzy of the type normally only seen late on Christmas Eve in the UK. Arriving at our local DIY store (the one whose name begins with Mr) shortly before 7pm, we found the car park jam packed and had to struggle to find a trolley. Entering the store in our quest for door handles, grouting and some lino, we were somewhat taken aback by the sheer numbers of people in the aisles. The reason for this DIY fest is something it’s useful to know about. Spending €10 on a DIY store loyalty card might seem like a lot but, here’s the good bit, it gets you invited to special 20% discount evenings where you can fill your trolley with all manner of home improvement goodies. ( It also gets you discount deals and money off vouchers). So, if you’re up to your ears in your own French renovation project, or plan to start work soon, I’d recommend applying for one of these cards. It really is €10 well spent. Right, just off to help the other half grout those tiles. Bon Weekend! It seems like every news bulletin you come across at the moment is all about cutbacks and inflation. Articles from the other side of the channel paint a gloomy picture of house prices falling. However, rather than the usual doom and gloom scenario so beloved of the British press at the moment – did the Royal wedding really cause a fall in House Sales last month? -this seems to be backed up by some depressing personal experiences. I heard recently that a friend’s property ,in a very desirable area in the South of England, has recently been valued at £40,000 less than it was at the end of last year! For the next couple of blog entries, I want to share some facts and figures about properties that can be bought in my own corner of France -without breaking the budget. If you can picture yourself living the good life but aren’t sure whether you can afford to buy, I’m sure you’ll be pleasantly surprised with what follows. Similarly, if it’s an investment opportunity you’re after, there’s good news there too. My local estate agent friends tell me that older, traditional style houses – maisons anciennes- are still favourite purchases with many buyers from the UK and, increasingly the USA and Australia. 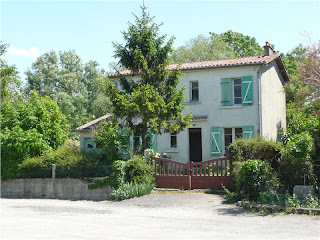 As the proud owner of an 18th Century farmhouse, close to the Deux Sevrès/Vendée border I can totally understand how much this type of property has to offer. The list of features often includes: oak beams, thick stone walls, impressive traditional fireplaces, a bit of land, possibly with some useful outbuildings to be used for storage or as potential gîtes. Figures from the Notaires de France report that the average price for a traditional property in the Deux Sèvres region is €109.800. This compares very favourably with the average price for a maison ancienne across all regions of France which, at €192.700 is a whopping €82.900 more! They also indicate that, following a price fall of 6.5% in 2008 – 2009 , by the end of 2010 prices in the Deux Sèvres had increased by 4.1%. Now, I know that these figures should be interpreted with some caution. Experience (and evidence from local estate agent colleagues) tells me that a figure of 4.1 is a little on the optimistic side but, there’s no doubt that the market here is starting to recover. What all this tells me is that now seems like a great time to grab yourself a bargain and, if you haven’t yet looked at Deux Sèvres, I strongly suggest you do. After all, if you can secure a traditional house for a little over €100.000, for around €200,000 ( just over the national average for France, remember) you could find yourself something really special. In my next post, I’ll be looking at prices in the south of the Vendée department and highlighting some of my favourite areas to buy. Normally I’m strict about my working hours. None of this – we live in France so it’s fine if I get up late, take five coffee breaks a day and spend 3 hours on lunch stuff for me. However, having said that…Wednesday morning saw me cheerfully packing the factor 30 and flip flops ready for a day on the Atlantic Coast with my other half and two friends. Any guilt I might be feeling was slightly alleviated by the thought that the trip wouldn’t just be a day out. Nope, this would be “research”. By the time we were halfway to the coast I was feeling positively virtuous, having convinced myself that I owed it to my clients to have up to the minute knowledge about places they might like to visit! Leaving aside the well-known delights of La Rochelle, we decided to head a little further north to somewhere quieter. The fine sandy beach at the seaside town of La Tranche glistened in the sunshine and we couldn’t resist the temptation to take off our shoes and wander barefoot along the beach. It’s possible to walk along the shore for kilometres in both directions and the bridge leading to the stunning Ile de Ré is clearly visible across the bay. This part of the coast was hit by the huge storm of February 2010 and planners have clearly decided to use the opportunity provided by the restoration work to make some improvements such as the new boardwalk running alongside the beach. There’s nothing like the combination of sea air and exercise for working up an appetite. In this part of the world there’s a huge range of fish and seafood so…again in the interests of research, we treated ourselves to lunch at the Equinox restaurant. Sitting at a table on the beach side terrasse, with stunning views right out to sea, we sipped our aperos and watched as the tide rolled in, a flotilla of little yellow- sailed dinghies drifted across the water and families enjoyed a dip in the sea. Talk about living the dream! As for the food – absolutely sumptuous. When we asked the waiter where the moules were from he pointed “ Just over there. I can always run and find some if we run out.” I think he was actually only partly joking as both the prawns and langoustines in my starter tasted amazing while the crusted fish that my husband and friend both ordered was obviously very fresh. That’s the great thing about living near the West coast, you can always enjoy of a whole range of freshly caught produce straight from the sea. Another stroll along the beach and a tour of some of the little shops just off the seafront and it was time to head home . I really enjoy the peace of country living but love it that we can easily pop to the coast when we feel like it. I feel another outing involving dinner on a terrasse watching as the sun sets over the sea is definitely justified. All in the interests of research you understand! Why do I love my job? Is it because I get to meet some fascinating people? Or is because property finding lets me see round some fabulous houses? This week, the answer to both of these questions is a definite and enthusiastic yes! When you look at a property, particularly if it’s an older house, creative imagination is a real asset. Being able to see beyond its existing state and recognise the potential that lies beneath can help people to make what can prove to be life changing decisions. Eileen and Walter Haddow are one couple who show just what can be achieved when personal vision is combined with a lot of hard work and determination. As far as inspiration and vision go….they have both in volumes! In the four years that they have lived in the Charentaise town of Civray, they have not only transformed an old barn into an attractive addition to their property, they have also created a thriving gallery and arts centre that now lies firmly at the heart of the community. 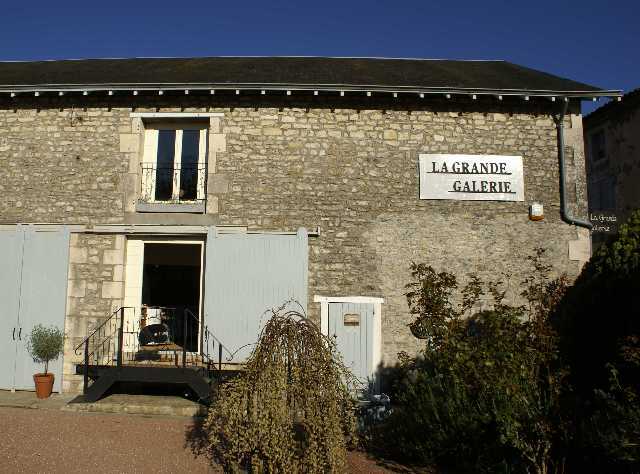 During our short visit, several people – both French and English -visited the Grand Galerie either to ask for help with a problem or to discuss details of a forthcoming artistic event (and this was on a Monday when the gallery is actually closed!). 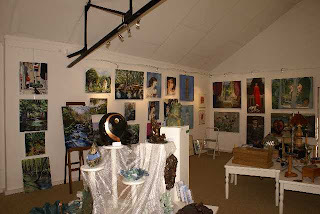 Within this tastefully restored space, artists from around the world come to exhibit everything from jewellery to sculpture, photographs and water colours. 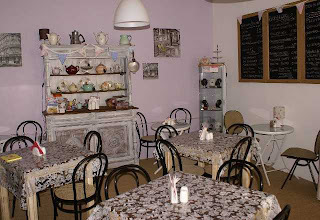 The ground floor, meanwhile, hosts: a charming cafe with menus in both French and English, art classes, musical events, an internet cafe and book exchange to name but a few. It is clear that, not only have Eileen and Walter developed a thriving business, they have also made a real impact in promoting the arts. Looking around, I could easily have spent a small fortune on any number of objets and only the presence of my other half halted my speculations about how I could manage to combine property finding with running a gallery! Walking from the sunny front courtyard (a setting for numerous community events) into the artistically furnished townhouse that the Haddows have made home, their creativity and love of the arts is evident everywhere. Even though circumstances mean that they intend to sell the Grand Galerie, you can tell that they have no intention of quietly retiring! Walter’s eyes gleam as he talks of travel plans and they both enthusiastically explain the possibilities that could be realised if a deal to buy an adjoining plot of land succeeds. Whatever Eileen and Walter decide to do, their warmth and energy will be sorely missed by their community. Although no one can provide a sure fire recipe for success when moving to France, for my money, their combination of imagination, hard work and enthusiasm are a great model to follow. Yesterday’s gorgeous spring sunshine meant that I was able to combine business with pleasure. The morning was spent looking at properties (and, admittedly, “researching” the quality of coffee and patisserie) in the charming little market town of Chef Boutonne. Business completed, a stroll round the town taking in the picturesque chateau and ancient wash house left me feeling relaxed and ready for an afternoon spent chez nous digging over the veg plot. Happily renewing my ongoing battle with the briar roots that still dare to make an appearance in the middle of my spring cabbages, I was interrupted by a call from a friend in England. I sensed that things weren’t going particularly well from the outset. “No, it isn’t”, “very windy” and “totally fed up” were the replies to my initial questions. (Good day? Weather? How are you?, in case you wondered). “ …Of course it’s different for you, living in France. You don’t have all that to worry about”. Well, of course it is different – that’s the whole reason we moved here. There are things we miss and some aspect of our lives here that aren’t ideal – in our case notably the bureaucracy. Better? In our experience, much better in terms of quality of life and definitely less pressured. Given my role as a Property Finder, I inevitably started thinking about pros and cons of buying in France as opposed to the UK. Seeking another point of view, I looked at The Independent business section and if their reporting is to be believed, it looks as if the housing market in the UK is heading for yet another setback. Mortgage lending in January was at the lowest levels we’ve seen since the start of 2008 .The CML (Council of Mortgage Lenders) noted that the figure for January was a depressing 12% lower than for the previous January. The same article reported that Howard Archer, chief UK economist at IHS Global Insight, warned that prices could fall by 5% in 2011 which would represent a fall of 10% from peak 2010 levels. This, added to the prospect of rises in interest rates in 2011, doesn’t make the UK property market seem the most attractive place to be buying at the moment. In contrast, the market in France is looking more stable. The French have always been more cautious about lending and so the “crise” hasn’t been quite so dramatic here. That said, prices did drop and it’s been possible to negotiate some really good deals as a result. In 2010 prices stabilized and the FNAIM predict a slow but steady increase as we go through 2011 making French property look like a good investment. As an added bonus, rates for a French mortgage are currently at their lowest since the 1940s making this an option that increasing numbers of British property hunters are picking up. All this “gives one furiously to think”… as my friend Francette would say. Taking all things considered, I’d much rather be contemplating life from my own particular French home than from anywhere else. Biased? Me? Surely not. As a former teacher, I’m always fascinated to hear about how education looks from the other side of the classroom. I know from my own experience and from working with local immobiliers that whereas ten or twelve years ago, the typical house hunter would have been around retirement age, we’re now also seeing increasing numbers of younger people with families making a permanent move to our area of Deux Sèvres and to the South Vendée. It’s only natural that a major consideration of such a move will be how the children will cope in school. Last week I was lucky enough to discuss this with someone who entered the French education system at the age of 14 totally unable to speak the language and who now, six years on is a fluent French speaker who passed her Baccalauréat aged 18. Catherine is a poised, confident and highly articulate young woman in her final year at Lycée who is looking forward to starting work as a PA for an International company later in the year. The first to admit that life as a teenager in a foreign country was, at times far from easy, her success has been achieved through determination and steady effort. I thought that her comments might be a useful point of reference. When I asked for her best advice for young people, she left the room, returning a moment later holding a pair of wickedly high heels. (Catherine, I should mention is in no danger of being overlooked being both tall and striking to look at). “If you run as fast as you can in high heels, even if you trip up, everything seems easier afterwards”, she said. I love that analogy. As she pointed out, even if you can’t speak the language very well, the very best thing to do is go for it. You might worry about tripping up but energy and determination will take you a long way. Come to think of it, that’s great advice for adults as well, although I guess most of the men I know might struggle with the running-in -heels bit! Learning within the family situation by watching TV in French together was suggested as helpful for language learning but also as a positive experience for the whole family to share. She particularly recommended The Simpsons for its familiarity and visual humour. Trying to talk French at mealtimes is also a good way forward. Though now fluent herself, Catherine confessed to being both touched and proud when her parents try out their language skills on her French boyfriend round the dinner table. On a more cautious note, Catherine advised all parents to avoid getting too lost in their own vision of what they want life in France to be. Teenagers, she cautions, are particularly fragile anyway and might find it much more difficult to adjust than younger children. This aside her final comment will, I hope, reassure parents thinking of making the move. “Moving to France…”, she said, “… is the best thing my parents have ever done for me. My life is far richer. I’ve learned a new language, I have great relationships and I love life here. I’ve been pushed to extend my limits and am really proud of what I’ve achieved”. So, if you’re considering making the move, best get out those high heels! Why is that whenever you put the word “private” before something it often sounds more appealing? Try it for yourself: private beach, private plane, private party…. See what I mean? Instantly they all sound more glamorous, more exclusive and, lets face it, more expensive. That’s certainly what you’d expect but…. I might just surprise you now. On my travels last week, I came across a pretty riverside cottage. Four bedrooms, green shutters, recently re-roofed. How am I doing so far? Sound quite appealing? I think so. Affordable? Possibly. If I go on to tell you that the riverside setting is in the heart of the stunningly beautiful wildlife haven known the Marais Poitevin , I expect you’d immediately add a few thousand euros to the price. Still within budget do you think? Maybe. 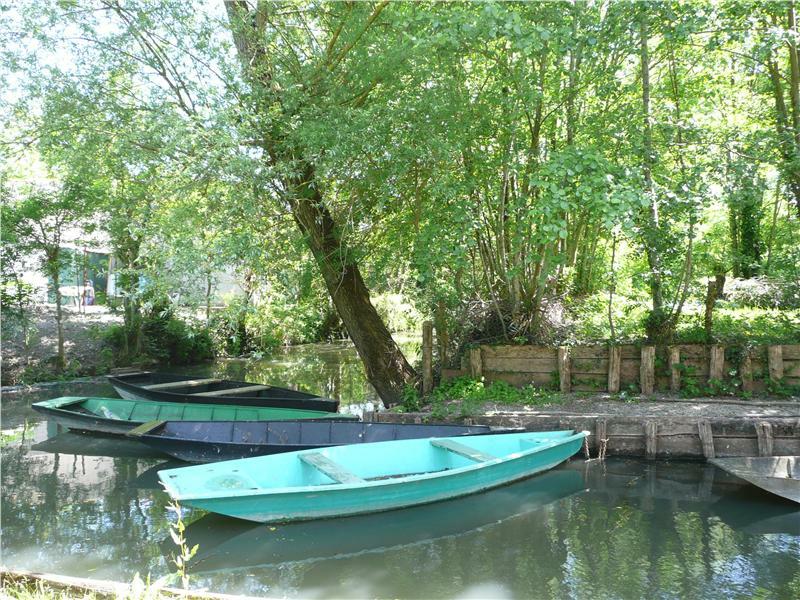 Then comes the clincher, this riverside house comes complete with…..it’s own private mooring! I guess that now you’re mentally adding at least another zero. Before you make your mind up about the asking price, take a look at the photos. Lovely house, picturesque setting, private mooring- over your budget,do you think? Now for the good bit. In the Deux Sèvres department, this little gem is on the market for a little under €150,000. In this area, you definitely get more for your money so ,being exclusive costs a lot less than you might think. Another reason I love living in this part of France. This week I’ve had a busy but very productive time out and about trying to find a well -restored traditional farmhouse that won’t cost an arm and a leg. Luckily the weather was on my side as the temperature went up, the sun shone and the countryside buzzed in anticipation of spring. So, into the car with my Summer Hits CD (always the optimist) on full volume, camera at the ready and a list of possibilities to view. The first two properties I saw were quickly rejected; one on the grounds that the badly bodged “restoration” work had succeeded in removing most of the house’s original character and the other since half the roof looked ready to collapse and the 70s inspired wallpaper in all but one of the rooms continued across the ceilings and doors – why, oh, why… ? I finally struck it lucky on Thursday in the countryside of the Vienne after a friend alerted me to a farmhouse on the edge of a little hamlet that friends were about to put onto the market ( MI5’s intelligence network is on the slow side compared to the intel of a property finder on a search ). By now, I was more than a little sceptical that this would be what I was looking for but … sometimes it’s good to be wrong! What a delight it turned out to be. Original beams, fireplaces and beautifully re-pointed stone work complimented perfectly by shutters in a delicate shade of green. By the time I drifted through the farmhouse kitchen en route to a well maintained garden complete with fruit trees and potager, I was completely sold. (No pool but, hey, nothing’s perfect and there was plenty of room to put one in). Even the price tag was enough to make me want to reach for my cheque book. Fingers crossed, this will be “the one”. Now, as the sun drops lower on the horizon, senior and junior cats line up in expectation of their evening meal and I can hear the encouraging sound of a cork being drawn, I can settle down to reflect on what has been a tiring but very rewarding week. Bon weekend! One of my concerns when we moved permanently to France was how well our young tabby cat Daisy would cope over here. So many things would be different: the language – should I have used flash cards to teach important vocabulary like souris & oiseau? 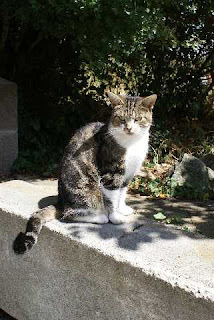 ; the food -for an English born cat used to no nonsense Go – Cat, Friskies were initially viewed with great suspicion, and last but definitely not least, what kind of treatment would she receive from a French Vet (or Veto as the French call them)? 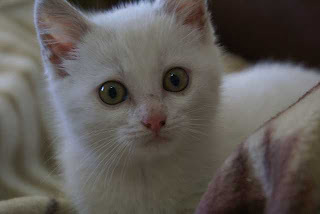 When, a few months down the line, we were also adopted by a tiny white kitten rescued from a pig farm, our experience of pet care in France developed rapidly. So that I won’t be accused of being biased, I’m handing the rest of this account over to the cats themselves. I was beginning to relax into La Vie Francaise ( yes, fortunately I have discovered a natural talent for languages )when “he” arrived….tiny, white, male and….French. An orphan of dubious parentage…but with a cheeky insouciant charm. It was his arrival that gave me an insight into French Veterinary Healthcare and allayed my fears…….. I may be a tiny white kitten but I’m certainly very, very lucky. When I first came to live with Les Anglais I was a sorry sight. Mama said I was so tiny and thin it looked like I had borrowed my coat from an older and much larger kitten! I also had a very swollen tummy. It really hurt and, even though I ate all my meals up, I never felt full. A few days after I arrived, I was very, very sick. Fortunately Mama made an appointment with the vet straight away. I was very frightened but Madame was so gentle with me and took such a lot of time to stroke behind my ears that I started to feel better straight away. I didn’t enjoy the injection she gave me but was very proud when she said I had a good strong heart and lungs! She also spoke to my Mama in English – just to make her feel welcome- and spent a long time writing out all the instructions for my tablets in English ( just a pity they didn’t realise that my name would become Fairgoose in France!). Mama said that the surgery and waiting room were very clean and noticed that a lot of the medicines that were advertised for Cats and dogs were the same ones that were used in England but were not so expensive. When I came home, I told Daisy that she should stop hiding in the barn because going to the vets wasn’t even scary and that, when she went for her injection next week, I’d come with her and hold her paw because after all -“je connais les ficelles” ( I know the ropes as they say in these parts). When we quit the rat race to live a quieter, less stressful life in rural France, I hadn’t realised quite how busy my new life would be! Several months of battling with a mountain of paperwork has seen my business established, my property finding web site up and running and a number of articles written. The culmination of all this frantic activity saw me rushing towards London for The France Show by TGV from Poitiers and Eurostar. Taking less than 6 hours, this is an amazingly quick and efficient service. (On my train the staff apologised several times because we were – are you ready for this- a whole 3 minutes late! British rail operators please note). I spoke to quite a few people who are determined to make their dreams of owning a French property a reality this year. 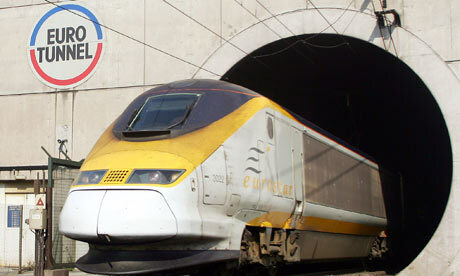 A number of these potential UK buyers mentioned that they were interested in the South Vendée and Deux Sèvres area because they want somewhere with better weather than England but they also want to be within a day’s drive of Calais so that they- and their families- don’t waste too much of their precious holiday travelling. I totally agree. Time spent in the car when it could be spent watching the sun set on your own terrasse while sipping a glass of chilled rosé and sampling some luscious local cheese, really is time that is wasted. The weekend flashed by and it seemed only hours later I was getting off the TGV (on time as it happens) in Poitiers. Away from the noise and traffic of London and back to my own peaceful French country home complete with large and small cats snoring before a roaring log fire (well, it is January) and husband pouring a well earned glass of wine. As Frank Sinatra once sang: “ It’s so nice to go trav’ling but it’s… so much nicer to come home”. Salut!